From top to bottom: Sand dunes show streaks of dust and carbon dioxide frost being blown by the wind. In Russell Crater mysterious gullies scar the face of a brown dune. It's unclear how they form, but sublimation—the instant transformation of carbon dioxide frost into gas when surface temperatures rise—could play a role. "We don't have anything on Earth that compares to this process," says NASA's Candice Hansen-Koharcheck. Across the tops of other dunes, dark tracks, looking like clumps of hair, appear where dust devils have scoured away beige sediments. And at the south pole, pits that grow wider each year pockmark a sheet of dry ice. Thermal evidence suggests a layer of water ice may lie below the slab. This crater is less than 1 million years old, and gives scientists a look under the covers of the Martian landscape. Like the images above, this one has been given a false coloration to help researchers distinguish dust from rock. Here, the rock is bluer than the dust. This image, of Victoria crater, is very close to the actual color of Mars. You can still see the swirling texture of the wind-carved rocks. 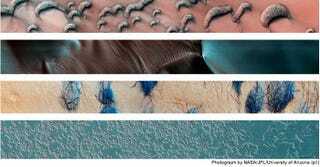 Visions of Mars [via National Geographic] Thanks, Marilyn Terrell!